Vegetables wait for no one. This is a lesson I learn every year, every season, and every crop. The vegetable does not care if I have a blog post or article to write, daily household chores to do, an appointment to keep, a phone call home to make, or in my most recent lesson - a flight to Hokkaido to catch to visit friends and hike for a week. Working with the weather, the soil, and their own biological clock, they do what they must most single-mindedly. At home in Michigan my popcorn crops stay on the stalk until perhaps late September or October. There they dry in the long summer days with an occasional dousing by storms and showers. I also watered quite religiously there while here I barely water at all. Our hose reached the garden and a rain barrel made daily watering a breeze. Here, the spigot is on the other side of the farm, and I must circumnavigate the eggplant field with its sometimes floppy sorghum border, blueberry bushes, the tomato and bean fields as well as a double row of magnificent sunflowers that rings the farm. Not so arduous, but with the heat and an army of mosquitoes, weeding and harvesting, I lacked the gumption more often than not. At this moment my theory is that the long, hot dry days characteristic of the weeks after the rainy season perhaps sped the ripening and drying process. I don't know Dakota Black well, so it may be something with the variety, too. Regardless, my umeboshi were replaced by long dark cobs of Dakota Black the morning our plane took off. Most of the cobs are a deep rich black, but two are variegated with specks of purple and lavender and one is nearly all white. 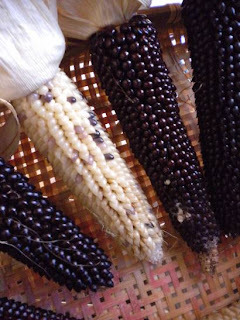 Perhaps cross-pollination occurred - most likely with the Takashi's corn - or I wonder if heirloom seeds sometimes simply produce an occasional rogue fruit. I mean, why not? Humans do. My other great surprise that morning? Well, there are two. A successful harvest at last (if drying goes well) from the garden is much-needed for my gardening morale. My zucchini trials and some trouble with the Brandywines brought me down a bit, I have to say. This harvest means a great deal. The second? Spying a fat Shishigatani squash happily growing while husking the corn! I would love to get my hands on some of your seeds. (popcorn) if you have any available. I love popcorn and we tried two years in a row, but the monkeys ate all the big ones and left us with almost nothing. And still. they say their "too busy singing to put anybody down." Those darn monkeys! I'll bring you some seeds if we can come. If we can't come, I'll gladly send you some along. I wonder how you could monkey-proof the beds?